Selling products online is a challenge. Ecommerce merchants rarely benefit from spontaneous buys, cannot easily generate emotional buying responses, and face tremendous price competition, since thousands of competitors are only a click away. Nonetheless, many companies — from tiny purveyors to massive multi-channel sellers — have found ways to succeed. In some cases that success is the result of getting ahead of trends, or — put another way — using new technologies or changing social conventions to engage customers or potential customers. In other cases, it can be a matter of applying small lessons learned from watching what other successful companies are doing. In 2010, Groupon and sites like it represented what may have been one of the most powerful new trends in the retail and services industries. In this article, you’ll find a couple lessons that Groupon can teach ecommerce marketers about engaging customers in the social media age. 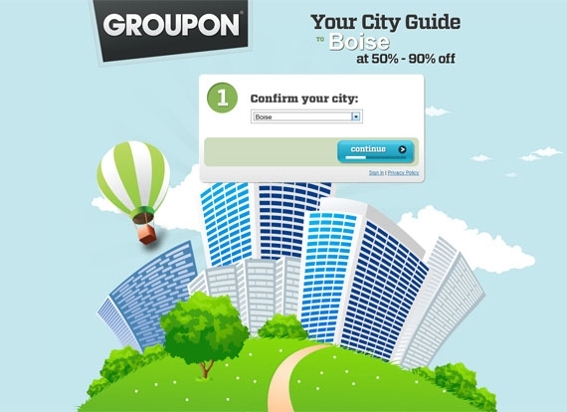 Groupon has become the leading deal site in the United States. Groupon launched in November 2008 and had reached an estimated market value of more than $1 billion in the Spring of 2010 after just 16 months in business. In the history of Internet business, only YouTube reach a billion dollar market valuation more quickly, according to TechCrunch. More recently, Groupon reportedly passed on a buyout offer from Google that was believed to be worth $6 billion, and it then launched a $950 million round of fund raising, that some published reports say could boost the company’s valuation to something like $7.4 billion. And remember, Groupon is still only about 27 months old. If those numbers are not impressive enough, consider that Groupon’s average daily revenue has been estimated at about $50 million, and remember that while Groupon is the clear leader in the segment, there are plenty of other coupon or deal of the day sites that are also succeeding. LivingSocial and CitySmart serve as a national and a regional example respectively. The question that ecommerce marketers need to ask is why Groupon and, to a lesser degree, similar sites, are so successful. The answer to this question, to paraphrase the The New Yorker’s James Surowiecki, is that it gives customers what they want: real value. Groupon does not accept any offer that a retailer wants to advertise. Rather, the company must approve the offer based on its perception of the deal’s real value. Once approved, Groupon takes an active role in writing the promotional copy and positioning the offer for success. It selects offers it can believe in and then gets behind them. For ecommerce marketers, the take-away may be to provide real value. Often, when one thinks about coupons or deals, the only aim is lowering the price or perhaps focusing on the price. Goupon tends to use the price as a way to engage potential customers in a dialog about the product’s value. When you’re developing coupons, Groupons, or even copy for pay-per-click advertising, consider using those marketing vehicles not just as a way to compete on price, but rather a way to get a conversation, if you will, started about real value. The goal of that conversation is not necessarily to make a sale, but rather to get folks excited about the product or service. Some pundits have said that Groupon’s real value is its massive email list, which might exceed 100 million names internationally and 50 million contacts in the United States. Others have even argued that if Groupon rented the list or moved to two or three emails per day, it might further increase revenues. But if Groupon started to “bomb” subscribers with extra emails — or failed to send good offers — having the email list itself would probably not be enough to be successful. Rather, it can be argued, that Groupon’s email list (and, by extension, site) is powerful because of the relationship it represents. Groupon’s subscribers trust that the company is providing them with some of the best values in the region. They know from experience that Groupon provides a consistently good service. They have a relationship that keeps them opening emails and buying. The lesson for ecommerce marketers may be that it is more important, perhaps, in the long run to build relationships with customers than it is to simple get one-time sales. This means that you may want to focus a greater portion of your marketing efforts on customer service, social media. Even better, follow up after a sale verses using quick-turn around tactics like PPC or SEO. It also means that if you are considering using Groupon for a campaign, you may wish to make an offer that is not necessarily profitable in order to begin a relationship with a large number of prospects. Groupon and similar sites get consumers excited about buying and can be a great starting point for a lasting consumer-retailer relationship. And while it may be a good idea to try marketing via Groupon, it is even a better idea to try and find other ways to provide real, exciting values to engage your potential customers.